Fig. 3. 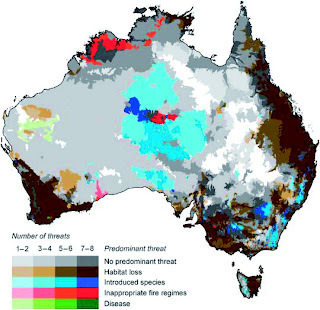 The distribution of the predominant threats to biodiversity across Australia. The “predominant threat” is the threat affecting the greatest number of species in each sub catchment. Where two or more threats affect an equivalent number of species, we consider there to be no predominant threat occurring in these subcatchments, displayed here in shades of gray. Darker colors indicate a larger overall number of threats occurring in the subcatchment. White indicates areas where no threatened species occur.